If you're going to use marshmallows, a toaster oven is almost essential, but an oven would work as well. First, start cooking the bacon in a frying pan. Next, place 1-2 large marshmallows or 7-10 mini marshmallows on every other waffle. 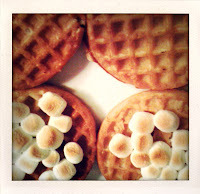 Place waffles, 2-4 at at time, in the toaster oven and toast until marshmallows turn a dark brown. Remove waffles from toaster oven and spread Nutella on the the waffles without marshmallows. Slice banana and place evenly on the the Nutella smeared waffles. 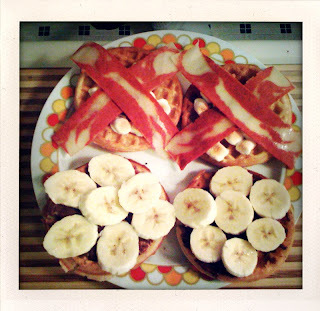 When bacon is fully cooked, place 2-3 strips on top of the marshmallow sided waffle. 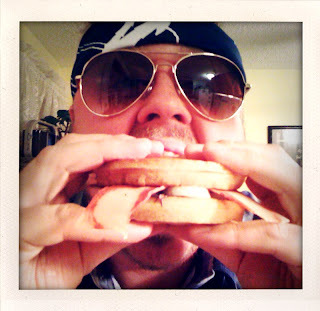 Combine into a sandwich and prepare to have your mind blown.